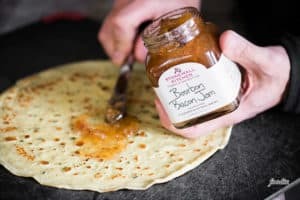 Savory Breakfast Crepes with Bourbon Bacon Jam are an incredibly easy and delicious option to start your day. 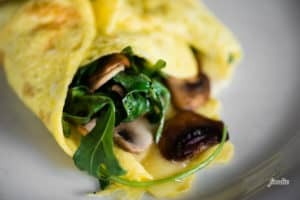 Savory Stonewall Kitchen Dill & Chive Crepes are wrapped around egg, cheese, arugula and mushrooms. Bourbon Bacon Jam adds an intense sweet and salty flavor that ties the entire spring inspired meal together! Whisk eggs with water. Add dry mix and oil and whisk well to blend all ingredients. For best results allow batter to stand 20 minutes. Preheat a 12-inch skillet (preferably non-stick or well seasoned enameled cast iron) to medium high heat. Grease lightly with butter (reserving remaining amount of tablespoon for remaining crepes). Pour about 1/2 cup batter on skillet and swirl to form a thin 12-inch circle. You want to pour just enough batter so that it makes the thinnest layer possible to cover the base of the pan. Cook approximately 45 seconds, or until it not longer looks wet and edges start to lift and are turning golden brown. Flip, then cook another 45 seconds. 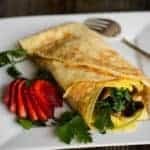 Make 4 large crepes and set cooked crepes aside until ready to assemble. In a medium sized bowl, whisk together the eggs. 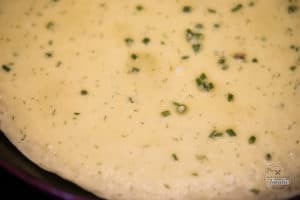 In a large skillet over medium heat, melt one tablespoon of butter. Pour in the eggs. You can choose to scramble them or cook them in a single layer without stirring if you steam with a lid. Top with cheese, allow to melt, then remove from heat when cooked. Heat remaining tablespoon of butter in large skillet over medium high heat. Add sliced mushrooms and arugula. Allow to cook without stirring 3-5 minutes, or until they start to brown. Stir and allow to cook a couple more minutes. Top each crepe with about 2 teaspoons of the Bourbon Bacon Jam. To assemble, divide eggs and veggies into 4 portions. Place on crepe and fold. Serve warm.